It’s easier to create healthy kids than fix sick adults. When a health problem is addressed early on in life, it can resolve quickly, whereas if it’s left to worsen, it can take years and high costs to deal with. 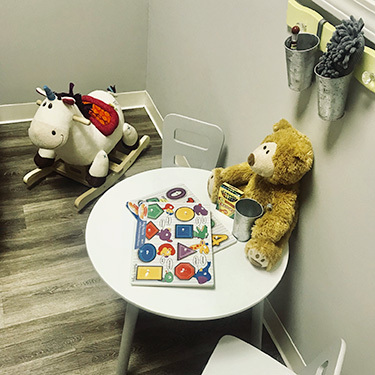 Dr. Amanda has trained extensively with Epic Pediatrics and the International Chiropractic Pediatric Association in treating all ages of kids, from the moment they’re born until adulthood. Many health practitioners look at statistics to figure out what a baseline should be for a child’s function. Rather than looking at commonalities, we search for what your child’s “normal” is and build on it so they can function at a higher level. Dr. Amanda can speak with you over the phone for a consultation so that you can learn more about how we’ll help your child. The new patient process for children is much the same as it is for an adult. We use the CLA Insight™ Subluxation Station to take noninvasive scans that show stress, inflammation and muscle tension present. The adjustments are gentle and tailored to exactly what your child requires on that day. It’s normal to feel some soreness afterward, but don’t worry; they can be their active selves and move around all they want after their visit with us. If you’d like to find out more about what we can do for your child, contact Fresh Start Chiropractic today! Same-day appointments are available.